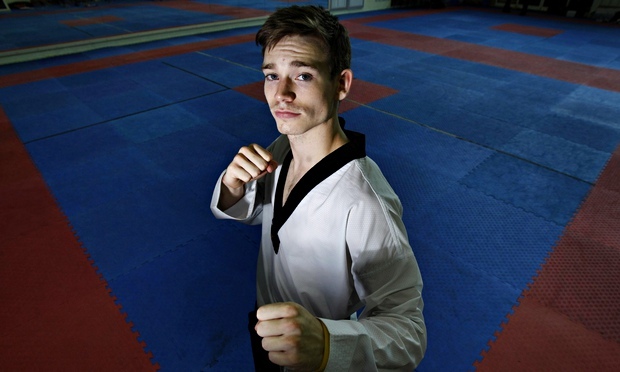 United Kingdom - 2015/04/16 - The British taekwondo fighter Aaron Cook has been cleared to change nationality and compete for Moldova in time for the 2016 Olympics in Rio. The Dorset-born Cook, 24, who was overlooked for the Great Britain taekwondo squad at London 2012, applied for citizenship earlier this month after receiving funding from a Moldovan billionaire, Igor Iuzefovici, and has already received his passport from the small eastern European state. The decision needed to be ratified by the British Olympic Association but that approval came on Thursday morning. A statement from the BOA said: “Following a request from the taekwondo athlete Aaron Cook to change his sporting nationality from British to Moldovan, the British Olympic Association today announced that Cook’s request has been approved. Cook, who fought for Team GB at Beijing 2008, felt he was overlooked for London 2012 – when Lutalo Muhammad, who was selected instead, won bronze – because he decided to quit the British program in 2011. GB Taekwondo has always denied this but Cook has refused to compete under the British flag since May 2012 and has fought for the Isle of Man since early 2013. He announced his intention to change nationality in a statement on Facebook at the start of April, saying: “Although I am upset and disappointed I will not represent my country of birth at another major championships, I felt I had no other option. The BOA chief executive, Bill Sweeney, said the governing body had tried to persuade Cook to change his mind but in the end could do little other than respect the athlete’s wishes. “Recognising Aaron Cook’s outstanding abilities and his performances on the world stage since 2012, the BOA’s preferred solution was to continue to work with all the interested parties to create an environment that provides a fair and equal opportunity for Aaron to be selected,” said Sweeney. “As of today, Aaron Cook has a named place for Team GB for the Baku 2015 European Games. We strongly urged Aaron to re-consider his decision to make himself available for selection to Team GB in Baku and to represent his country of birth, rather than proceeding with a change of sporting nationality. “Despite the fact that there is no legitimate case for nationality change here, the BOA cannot compel any athlete to represent the United Kingdom against his or her will. As such, and as Aaron has now reiterated that he wishes to represent Moldova, rather than the country of his birth, at future taekwondo competitions, the BOA will not stand in his way. Cook has previously said he hopes to represent Moldova for the first time at the inaugural European Games in Baku in June having served the mandatory three-year period since representing a previous country.